It is estimated that more than one million people each year are injured in accidents in which they slip, trip or fall, with some 17,000 dying as a result. Unsafe work conditions, wet or icy floors and sidewalks, inadequate lighting, or poor maintenance can all be causes of so-called slip-and-fall accidents. Falls alone – from ladders, roofs, scaffolding, vehicles and other work areas – caused 827 deaths on the job in 2006, the latest year for which the government had finalized statistics. But people were also injured or killed at a variety of other premises, including private and public property, such as nursing homes. If you or someone you love suffered a serious injury or death as the result of a fall, you may want to contact a slip and fall attorney. In Pennsylvania, Delaware and New Jersey, call Kline & Specter, PC at 800-243-1100. We have more than 40 attorneys, several of whom are also doctors, and we offer free evaluations for possible slip and fall injury lawsuits. A study conducted by the University of Florida found that the most frequent injury suffered in slips and falls were injuries to the back, which accounted for about one-third of the total. More than another one-third was injuries to other joints, including the wrist, elbow, shoulder, ankle, knee and hip. 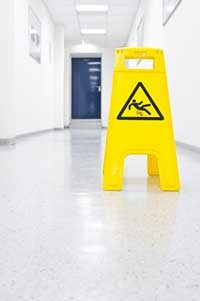 The study concluded that roughly one in seven disabling work-related injuries were due to slips, trips or falls, many from elevated areas. And nearly one-third of all such fatalities were suffered on the job. In many of these cases and non-workplace slip-and-fall injuries, the employer or property owner may have been negligent in their responsibility to provide a safe jobsite or premises, in which case they could be liable for damages. Please call 800-243-1100 to speak with one of our experienced attorneys about a slip and fall lawsuit in Pennsylvania, New Jersey or Delaware.